You must be a Millionaires’ Club member to participate. The offer is available from Monday the 15th April until Sunday, the 21st April 23:59 GMT. You'll receive £20 Bonus on Instant Win games (3x wagering) when betting at least £100 on any Lottery. The following Instant Win Games are excluded from this promotion: 90 Ball Bingo, Bingo, Bingo Jackpot, Blitz Lotto, Cashtrovaders, Clusters, Crossword Riches, Euro Jackpot Play, EuroMillionaire Instant, Gold Hunt, Keno Play, Keno80, KenoGo, KeNow Play, Lotto Machine, Lotto Play 6/49, Moorhuhn Classic, Moorhuhn Extreme, SkullDiggery, Snakes & Ladders, Star Match, Sushi Master, Fly Piggy Fly. The £20 Bonus will be credited automatically to the players account after the purchase. You must wager the entire sum of the Bonus 3 times on Instant Win games before you can withdraw any winnings. For example, if you bet £100, you will be awarded a £20 bonus. You will then have to wager the £20 bonus 3 times on Instant Win games, which is a total of £60. The minimum cart is £100. This offer can be redeemed up to 5 times within the promotional period. The bonus is valid for 7 days after crediting. 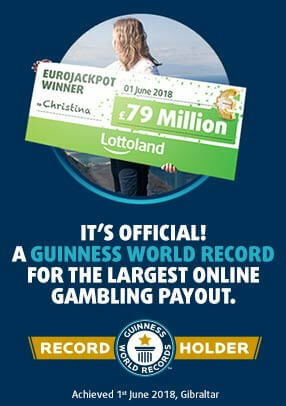 Where any term of the offer or promotion is breached or there is any evidence of a series of bets placed by a customer or group of customers, which due to promotional offers result in guaranteed customer profits irrespective of the outcome, whether individually or as part of a group, Lottoland reserves the right to refuse payment of bonuses. In addition to these Promotional Terms, the Player’s use of the Website and your participation in any gaming or wagering (including any promotions) is governed by the general terms and conditions which are found here (“General Terms”). Players should ensure that they have read and understood the Promotional Terms and the General Terms before taking part in this promotion. In the case of any inconsistency between the Promotional Terms and the General Terms, these General Terms shall take precedence. All promotions are limited to one per person, unless otherwise specified. Any person found to be operating multiple accounts in promotions will be in breach of these Promotional Terms and the General Terms. Lottoland will determine at its sole discretion by whatever means it deems necessary to establish if different entries or accounts are connected to the same person. Participants, whether individually or acting in a group, will be found to be in breach of these Promotional Terms and the General Terms if Lottoland, in its sole discretion, has reason to believe that a promotion has been abused, manipulated, or that irregular, fraudulent, collusive or illegal activity has occurred. The decision of Lottoland in all promotional matters is final and no correspondence will be entered into. Lottoland reserves the right to withhold promotional benefits until resolution of any dispute. The decision of Lottoland in respect of any matter concerning or related to competitions and promotions is final. In the event of a breach of these terms and conditions Lottoland reserves the right to take such action as it deems appropriate in its absolute discretion. A breach by a participant of these Promotional Terms and/or the General Terms or where there is evidence of a series of bets placed by a participant, whether individually or acting as a group, which due to promotional offers result in guaranteed customer profits irrespective of the outcome, may result in Lottoland withdrawing the availability of any promotion or all promotions to that participant or group of participants and/or voiding any wager funded by the promotion and remove any winnings from such wager. Lottoland reserves the right to amend or withdraw any promotion at any point at its sole discretion. Promoter: Lottoland Limited, Suite A, Ocean Village Promenade, Ocean Village, Gibraltar, GX11 1AA (“Lottoland”).